This Bootleg compilation is no longer in my closet, you probably suspect why. Anyway, this record contains the rare Overscrupulous EP, Wall Of Berlin EP (both released 1979), the Were Comin EP and their only full length Fun? from 1980 plus tracks which was recorded live @ Tavastia, Helsinki 25.5.1980. 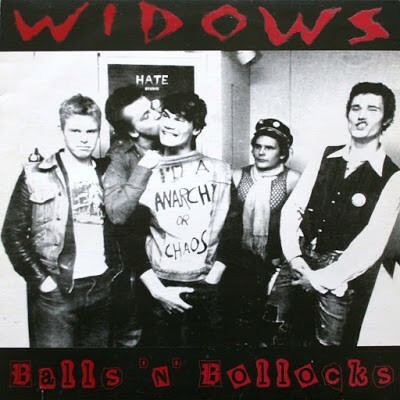 The Widows were formed in early 1970’s by brothers T.B. Widow (vocals, bass) and Johnny Widow (guitar), after been influenced by bands like New York Dolls. It wasn’t until 1975 that they got a permanent drummer as Rocky joined them. The first one, for Love Records, had been recorded in 1978, but for some reason wasn’t released until May 1979. This delay didn’t make the band happy, so they switched to Poko Rekords after that. Things didn’t work out very well within the band: Rocky had had enough and left, and Jacky announced that if Kelloggs wouldn’t be kicked out, he would leave. So Kelloggs was out, and new guitarist J. Blockhead, as well as drummer Archie, was in. This lineup recorded the Fun? album in 1980. However, the lineup changes hadn’t improved things that much, and Widows started to fade out. The finishing blow came when Jacky was sentenced to jail. Widows, in essence, was disbanded. Still, they played one more gig in Lepakko, with Pete Malmi on vocals, and even visited studio (T.B., Johnny, Pete Malmi and Affe Forsman on drums), but the recordings were never released. (Info by Mika Saastamoinen). They are represented on numerous compilations. Excellent stuff in every way.